So, we asked members of the current nursing team as to what it’s like working in the MBU, and here’s what they had to say. “Working on the MBU is a real privilege. Like all other wards and departments, you need a sense of compassion and commitment for our service users, but where the MBU differs is where the lives of the mothers become entwined in the lives of their babies. It is a wonderful thing to see at first- hand how our support for mothers and mothers to be, has a real impact on their lives, their babies and the family as a whole. Since coming to work on the MBU, I was made quickly aware of, not only the needs of the women using our service, but also the therapeutic needs of Dads and how they also need to be supported through the mental health journey of their partners. Men have distinct needs and show these very differently than the women we care for. That’s why working in an MBU is a role for both men and women as both offer something special to the people we care for. 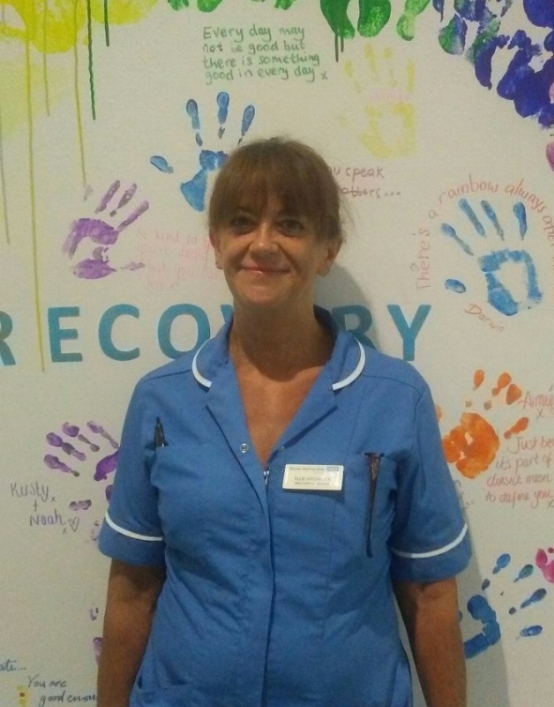 “I enjoy working on the mother and baby unit because the team are dedicated to achieving positive outcomes for mums and their babies. This is accomplished by forming professional relationships with patients by talking and listening to the mums, completing various activities, counselling and psychotherapy. “When working on the MBU two days or nights are never the same! The Nursery Nurses work as part of a multi-skilled team. We support mothers to provide care for their babies from new-born to aged 12 months. The tasks we support with include practical support of daily care for babies including feeding, bathing and nappy changing. We also get to organise a variety of fun sensory and play experiences that are age appropriate for the babies. This may include baby massage, water play or messy play. We also provide care and play opportunities for visiting siblings. We have an outdoor space and can also support with escorted leave which perhaps may be accompanying a mum with her baby to the local GP surgery or supermarket. The role includes supporting mum and baby interactions. By giving guidance and modelling interactions with babies to support their development and also building a positive relationship between mother and child. This can be challenging at times and distressing to see both mum and baby struggling to make a connection but when you see the glimmers of recovery this can be so gratifying and fulfilling for all involved. As a Nursery Nurse we are able to provide information around the day to day care of the babies and promote the development of the child, which we track using the Early Years Foundation Stage (EYFS). Build on the permanent unit continues to progress extremely well, and with the roof and soon to be built walls, it is hoped that the building will be watertight ahead of the winter months. The latest edition of the Interserve Newsletter can be read here. Newer PostThe Perinatal Team are expanding!